Beautiful Aqua condo near PIER PARK! Aqua 1806 has a fantastic view of the Gulf! We are only 2 blocks from the popular Pier Park. Pier Park offers great dining and shopping. This condo is perfect for a family getaway at the beach! Please reach out to me at ncullinane1 at gmail. Reserve our luxury oceanfront condo. We take great pride in offering a vacation condo that is beautifully decorated with upscale furnishings. Spoil yourself and stay at the best! Whether sunning on the beach or relaxing on the balcony, the sparkling blue water contrasting the pristine white sand is unforgettable. Ocean views and sunsets from the balcony are breathtaking. Likewise, the master bedroom and living area offer incredible views from our 9' floor-to-ceiling windows. The separate bunk room has twin bunks, flat screen TV and DVD player for kids' enjoyment. Our fully-equipped kitchen has granite counter tops, first-class appliances, and washer/dryer. 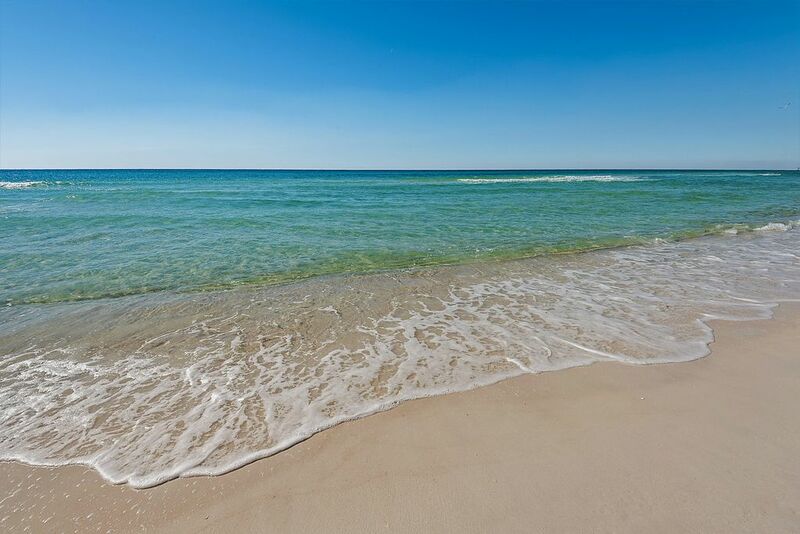 Aqua is Panama City Beach's premier resort property. From the moment you enter the elegant lobby with its cascading water fountain, you will agree. Aqua offers 2 beautiful pools just a few steps from the beach. One is indoor/outdoor and temperature controlled. There is a poolside cafe with Wi-Fi and big screen TV, an outdoor grilling area, fitness center and much more. Last but not least, you are 1 block from PIER PARK, Panama City Beach's new exclusive shopping, dining, and entertainment destination! We were on our honeymoon and our condo couldn't have been any nicer. Would stay here again, again and again. The condo was perfect and had everything we needed! Great location! Plenty of shoppes and places to eat nearby. Ms. Nancy was great and answered any questions I had prior to booking almost immediately and was very helpful! The beach chair service was an added bonus and helped to make our stay that much more enjoyable and relaxing. We would certainly choose this condo again on our next visit! Condo 1806 was perfect for me and my family. Everyone had their own personal space - we weren’t cramped at all (like you often are in typical hotel rooms). The balcony and view of the beach and ocean were perfect! And the kitchen was fully stocked with all the items you need to cook full meals. Access to the beach and walkable restaurants was super easy. I would definitely stay in this unit again. Thanks for a great stay, from Jean K.
Great condo. Peaceful with amazing views. Great place! Would highly recommend! This was a last minute trip we decided to take and the owner was very accommodating in making it work for us on such short notice. The unit is nicely appointed, extremely clean, and the king size bed was very comfortable. Has a HUGE Master Bath. The condo was exactly as described, and the Aqua Complex seems very upscale. Plenty of restaurants close by to walk to, and with Pier Park about a 5-10 min walk away, we were right near all the action. The city put on an amazing Fireworks display for the New Year. The only thing that sucked was the dense fog that would never go away during our entire stay, but thankfully we could see the fireworks. Can only imagine the view from the 18th floor on a pretty day. Oh, and the elevators are fast in this building. Would most definitely stay here again. Rates are subject to change until reservation is confirmed with owner. The standard rate varies by season.